I strongly believe that your enrollment packet is the icing on the cake when it comes to parents making a decision to choose your Child Care program. In fact, your enrollment packet can make or break the sale! Several years ago I decided to buy 2-pocket folders to create my enrollment packets. 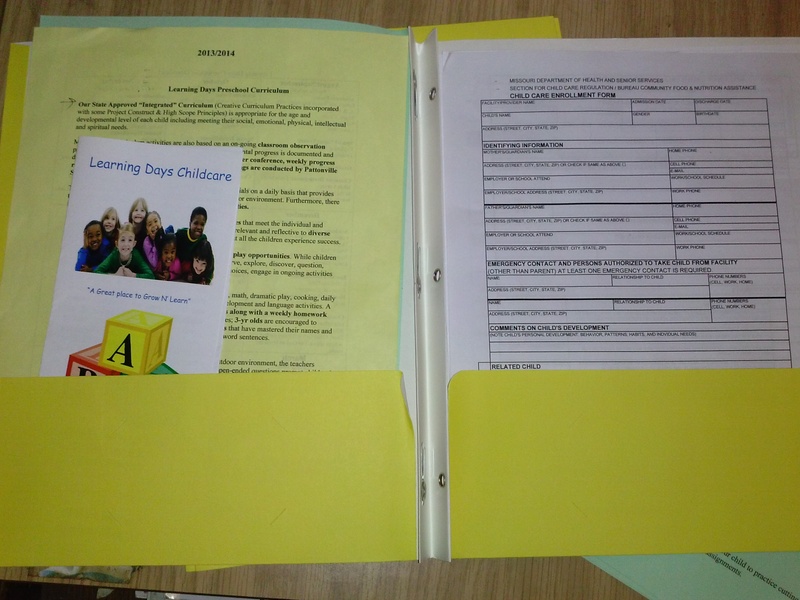 In fact, I chose 2-pocket folders because its an organized way for parents to keep all of their enrollment forms in one place! Also when you look at 2-pocket folders, what do you think about? If you were thinking School……That’s exactly what I want parents to think about when they see my enrollment packet! When you think of School, you also think of Learning and that is the message that I want to send to parents about my program. My Child Care program is very educational and that’s the message I intend to send to parents…upfront! Furthermore, as you create your enrollment packets, think about the message you want to send to parents about your Child Care Program. There is no cookie cutter way to prepare enrollment packets, however, I simply want to inspire you to prepare your enrollment packets with a message in mind. When should You Issue Enrollment Packets ? When parents stop by my facility, I give them a tour and at the end of the tour I offer a trial day. If they sign-up for a trial day, I give the parent a copy of my Curriculum Information, a Brochure and my Business card. After the trial day, if the family is still interested in enrolling their child; I give the family my entire enrollment packet. **Being selective over who receives your enrollment packet is a great way to cut your marketing cost. I look forward to reading your thoughts about this post. Leave your comments below and be sure to share this post with other Child Care Business Owners. Love this post? You will love my Marketing 101 toolkit! Every year in August as my summer camp comes to an end, many of the school-age children leave the program to go back to school and this usually leaves 16-to-20 slots for me to fill. In fact, this year, I started marketing my program 6-weeks before the camp ended, so that as the school-age kids were leaving the program….the preschoolers would be coming in. I kindly reminded her that this season is not going to last long and that we will have new students coming soon. Also, I encouraged her not to worry about her hours being cut or losing her job. After I spoke with her, she smiled and appeared as if two buildings were lifted off her shoulders. Moreover, since my talk with the teacher who was concerned about low enrollment, I have enrolled six new students and this was the response that I received from that concerned staff member, Wow! You said more children would be coming! I only have a few more enrollment slots to fill, however, I am so thankful that I did not have to lay off staff due to a sudden shift in enrollment after the summer camp ended. Furthermore, after my brief talk with that teacher, I also realized the importance of having open and supportive communication with your staff during tough seasons. Furthermore, be careful of the words that you speak over your childcare business as you build enrollment. Your words are so powerful. So, be sure to stay in a mode of expectation. I shared my story with you to encourage you to reassure your staff when there is a change in enrollment, especially during low enrollment seasons. Here’s something to think about: you depend on the money from your business to pay your bills and your staff depends on you to provide them with a job to pay their bills, so in the event that you foresee or anticipate a shift in enrollment, they should be informed. This will help to minimize unnecessary anxiety or gossip. Also, be sure that you are not worried and always have confidence that more kids are coming. As you walk in confidence during a Low Enrollment season, you can be assured that your staff will catch that same attitude!